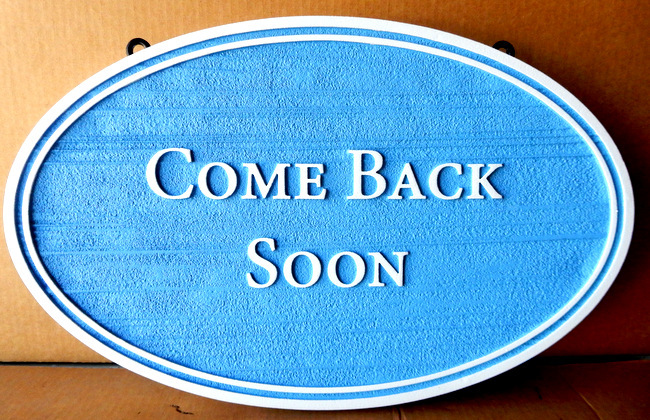 This carved and sandblasted High-Density-Urethane (HDU) "Come Back Soon" sign for a B&B has a raised text and double border, and a sandblasted background with a light wood grain texture. After artist painting of text and borders, the sign is clear-coated twice for additional weather and UV protection. This sign can be mounted on a post or hung from a scroll bracket or beam supported by two posts. To see over 50 examples of office, vacancy/no vacancy, building name, directional, wayfinding, parking, maximum occupancy, dining , informational, restroom, and farewell signs signs for hotels, motels, inns, lodges, and B&B's. please click on "Return to List" below right.